June 1944. The Allied armies stand poised to invade Normandy and liberate Europe. And one cranky, cigar-chomping prime minister is doing himself no favours by bending the ear of anyone who’ll listen with premonitions of disaster if the D-Day plans go ahead. Despite the title, this isn’t a straight biopic of Winston Churchill (Brian Cox). Nor, for the most part, is it a saintly portrait of the man, the legend. 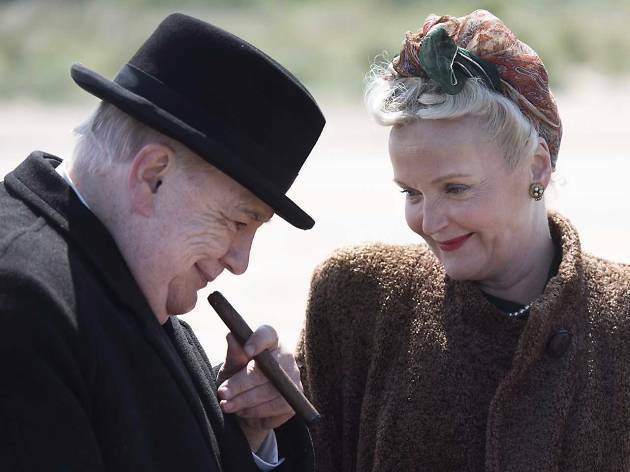 In fact, for the first three-quarters it’s a surprisingly even-handed depiction of aristocratic stubbornness, as Churchill – no longer leading the war effort after the Americans stepped in – storms around England arguing with General Eisenhower (John Slattery), his long-suffering wife Clementine (Miranda Richardson) and even King George (James Purefoy) as he struggles to prevent what he’s become convinced will be a military disaster. Cox is rudely magnificent, capturing not just the wilfulness of the man but the nagging self-doubt at his inner core. But the film is just too bloodless to be fully convincing. Composed almost entirely of repetitive barking matches in elegantly furnished rooms, it never sells us on the global importance of what’s about to happen. The final act’s descent into sentiment is hardly a surprise but it’s still disappointing. ‘Churchill’ closes, bizarrely, with a title card informing us that Winston is frequently voted the greatest Briton who ever lived, as if to suggest BBC teatime polls are of some historical relevance. Still, it’s likely to do well with its intended audience of WWII buffs and those old enough to remember the man first time round. Not being British I was keen to see this film and get some knowledge of history. Don't expect an exciting film, but expect a moving story of a man who struggled with the loss that both world wars brought and tried with all his strengths to protect those fighting. I've enjoyed it, but I can see that many may not feel the same. If you are keen to learn about Churchill, don't hesitate. This was definitely not the movie I expected to see, as I was expecting a faster paced, louder and bigger budget movie. Instead this was clearly made with a lower budget than a normal biopic but the performances really shone despite the script being something of a let down. The bulldog we all know Churchill for being was portrayed as a jealous and bitter man with an extremely bruised ego. For me personally, it was interested to see Churchill being portrayed in this light and Brian Cox really captured that side of the character. If this was released around awards season I am sure some of the cast would be considered for Oscar nods but the movie itself would fall aside. Undoubtedly great performances all round can't save this confused piece - it probably would have worked better on stage but on camera it struggles. In order to create dramatic tension the story has Churchill trying to halt the Normandy landings - the historical accuracy of which opposition is incredibly doubtful. It's King Lear with a rather tedious plot. Miranda Richardson is wonderful though. No kiddies, this film isn’t about the bulldog that advertises insurance on the telly although judging by the level of cinematic worth of the offerings at my local multiplex it is refreshing to see anything of artistic and historic value in these unenlightened times. This version of the Churchill story covers the three days before “Overlord” and the Allies’ D-Day assault to liberate France in June 1944. Like “Hamlet” and “Lear” playing Winston seems to have become a rite of old man’s passage for actors. Like Albert Finney, Brendan Gleeson, and others such as Tim Spall before him, Brian Cox does a superb job of portraying the Old Warrior. 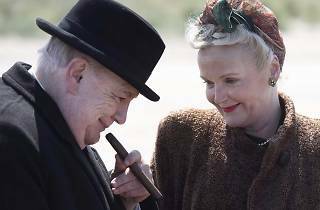 Miranda Richardson is also brilliant as his wife “Clemmie” - patient, loving and loyal to the core but not afraid to have a bit of a go when necessary. Cox is pure “Lear” at this stage of Churchill’s life - ranting, guilt-ridden (Gallipoli, of course), convinced of the unnecessary massacre to come when the Allies hit the French shores. He has many points on his side of course but reluctantly he is forced to realise that however much he table-bangs and shouts, Supreme Allied US Commander “Ike” Eisenhower is now the boss and calls the shots on this momentous event. The movie is a little spoiled in my view by over-sentimentality and a pointless and incredibly unlikely sub-plot involving his secretary’s midshipman boyfriend who is on one of the Allied assault naval vessels. For all that, Cox carries off the role superbly and not a trace of his Scottish heritage is discernible as he chomps on his cigar and glowers at anyone who blots his tunnel view.